In an effort to avoid the air pollution and as part of encouraging C to learn to swim we shelled out two memberships to/for the local gym. It lies on the third floor of our neighbouring 4-star hotel (no, not in the basement). The 20m pool is 1.2-1.4 m deep (would you notice a change in depth? ); all the fitness suite equipment works and there are just enough free weights to keep the serious gym-user happy when travelling. The fee for 3 months will be worthwhile if we continue to go three times per week – the sums say that will have been better than paying for shorter periods and it will be even more worthwhile if we successfully establish routines that improve health while allowing us to live in Beijing. We joined a gym in Qingdao for the winter months and discovered a few things. Most noticeable to us was that C is the fastest user of a treadmill excluding myself; she is happy at 12kph where I prefer 14 and in QD we would both habitually do 15 mins with a target average to exceed those figures as mean¹. When you allow for the machine rolling up to speed, you need about 0.5 kph over the target to catch up the shortfall. I can do 16kph for a short while but then a shortage of air prevents sustaining that. I am sure that our regular use of the running track in ZhaoQing was faster than those figures and I offer a few reasons, though they might be excuses: (i) the visual or physical confines of a treadmill seem to reduce one’s ability to sustain speed, making me wonder if perhaps we wander off the straight line far more than we care to admit when in open space (ii) the treadmill is unforgiving for variety of pace, not even for a single stride and there is an element of trust / faith demanded (in self or machine, I’m unsure) that you really can sustain the chosen speed (iii) there is a little action (yes, that’s ambiguous) around in the gym and it is distracting – I would agree with anyone who says it is relatively difficult to concentrate (iv) it is not the same surface as found outside (v) increasing age. I can argue with some of these. First, a treadmill permits a variety of style; I notice many users who need a quiet word about style (but are zoned out on their iPods and oblivious) – my standing advice is that if you can hear your feet hit the ground, you could improve your style, on the simple assumption that such an audible impact must be doing damage. I find that the ‘mill allows me to attempt different (better) styles, though I can’t sustain them for long. Second, concentration difficulty is a false argument, though distraction might be valid; when track running the issues are based around idiots in the way; not so in the gym, where you are more likely to be the distraction yourself. More true to say that in the gym there is nothing to chase, that motivation is hard, that a single speed is not what we actually want to do. Third, no, it is not the same surface and there is good and bad in that: good, in that everything is predictable and repeatable so there’s little excuse for bad style; bad, in that any bad motion will become ever more ingrained as a bad habit. That actually argues in support of the hated mirror in front of the runner and against the television screen. I note again that having a nice surface allows bad habits to be excused (no penalty paid until way, way later). As for age, I recognise around a 1% compounded penalty² with each year, though I suspect there is a sudden increase in that fall-off imminent. A few at QF were genuinely into physical culture – we had spent an age finding a gym where most things worked, where the washing facilities were adequate and where there was enough aerobic equipment. Funnily enough the simplest test seemed to be to look at the free weights; a good gym has a decent collection that looks used. A good (my measure) gym also has everything working and enough of the aerobic stuff to occupy a lot of customers (i.e. for queuing to be rare). My only criticism of the gym we use in BJ is the lack of rowing machines (ergometers, properly). My standing criticism of the fixed weight machines is that working a direct group of muscles is fine only if the opposing muscles are also worked; you can do that yourself by moving the weights slowly enough in both directions. For example, take a curl (I don’t care which) – you’re pulling something towards you. The paired muscles will be worked if you let the weight not fall back, but control its movement. Even that isn’t really working the opposing muscles separately; preventing something moving is not the same as forcing it away. We should really be moving free weights around with care, but that doesn’t fit the image of ‘going to the gym’. Worse, if you actually plan a routine to fit your objectives, you could be in the gym a very short time and still be very effective. A long time ago at Shiplake we used to have a routine target: put a ton⁴ above your head and go. My preferred method was to go to the weights machine that allowed me to move the whole stack using my calf muscles, though the weight rested on shoulders and the machine was meant for squats. I could bounce 200kg through 5 or 6cm 100 times in a little over a minute. That’s a tonne through a metre already. Cycling. Unless there is a set of programmes offering a picture of the route to pedal, these are amazingly boring. The pedal radius is too small, the resistance is somehow false and the posture is always in the wrong place. I have seen a ‘spinning class’ in Nanjing that looked far more like bikes, but only that once. I’ve used them reluctantly and enjoyed only a machine in Camelford that showed me where I was going – or pretending to. The open road, a good bike and sensible fellow road users would be far more fun. Stepping machines. Those that I have tried have huge resistance, so either one simply waits (weights?) for the step to work its way downwards, or one pulls hard on the framework. Since there are no handles provided, this is clearly not what the machine is designed to do, but nothing else provides what I would call a workout. Therefore this is a class of machine designated useless except for filling in while waiting for something else to come free. Cross-trainers. The stepping machine that works; these have long handles roughly like skiers’ poles that one can put work into. A lot of work goes into something called a kilometre and I’ve often lost (or gained; moved anyway) a sweaty puddle to tidy up at the end of 10 or 15 minutes on one of these. The better ones offer a range of routes / programmes, etc and even heart rate readouts. Treadmills. Discussed already, but a variety of machine allows an upper bound on speed of 14 to 20 kph (nominally) and an elevation of 0 to 20 degrees (or some other vaguer angle unit). That is to say, some machines don’t do elevation at all. I have once used a machine that allowed negative gradient and therefore could simulate a run with downhill and uphill (that’s not ‘as well as’, since the downs were always slight). There are arguments that say we should not notice a 2 unit slope; at some speeds I notice nothing at 7 units. I have a growing habit to add slope and speed together and set an session target of, say, 17 or even 20. They don’t quite add, and I’d love to hear from someone who knows how the machines work out kCal/hr or similar units – I’m comfortable at 1250-1300 but rapidly really uncomfortable at 1500. Ergonometers. Often called Ergometer and means a measurer of work, what I mean is a rowing machine such as the Concept II. I also found a water rower and an animation. I’m familiar with the units, the style and the tests. 2000m is too far for me now and 300m seems to lay me out. The 500m that used to be repeatable under 1:30 in the boat (in 1975) is now a struggle to beat two minutes, and second digit of four (e.g. 1:49) is a major success. Fundamentally boring, emphasis mentally boring. I am curious how the various machine calculate ‘work’, be it in Watts or KCals, as they don’t seem to be measuring equivalence. Or, if they do indeed measure equivalence, then it is no surprise that I continue to run, since 1200 kCals/hr running (according to that treadmill) is comfortable, where 900 on the ergo is quite enough and 900 on the cross trainer (skier thing) is about okay. C finds 950 on the treadmill about right. I wrote at length about heart rate and then, a day later, moved that to another essay, since I found steadily more that was news to me and perhaps worth sharing. Assumption: if I’m interested and relatively knowledgeable about this topic and then I find I’ve been misled (a historic state of misle-dom), then there is stuff worth sharing. The second thing we noticed when people-watching in Qingdao was the amount of weight moved, whether free or within equipment. Those few chasing physical culture were moving large weight, near their limit, in small numbers of repetitions [5-10]. They were, counter-intuitively, also spending many hours per week in the gym. Fat loss (growing that set of abs, the six-pack, whatever) is what you’re really after, because by losing the layer of fat on top you reveal the muscles that were always there (dream on). The fastest way to achieve that target is to threaten the body, to provoke the flight or fight response, by pushing yourself into a place where the body feels stressed (stressed enough, in the way that produces the result you are after). By moving a maximal weight a minimal number of times the body eats its own fat because, in some sense, the status quo has been threatened. This is the so-called secret ingredient to weight training; mixed with a sensible approach to diet you can keep the excess fat off and show those glorious muscles (if that is what you want; most of us simply can’t be bothered enough to sustain the effort required). That’s not at all the same as training for, say, a 10km race, where the ability to sustain a high level of work is required. Moving large weights a few times will achieve an objective, but that objective is not one of mine. Yet, while we saw those select few moving significant weight, maybe 10% of the users of weights, themselves a minor fraction of the gym users in QD, they still didn’t move much as a total. I had a brief disagreement with one pair of guys, who saw me most days for a week and thought to encourage me to move more weight on the thigh curl; I use it to strengthen the muscles across the front of the knee, a definite weak point on me; I know I should (and now do) work on the corresponding muscles for the opposite movement, but moving a major fraction of body weight seems the right level, and 50 reps, maybe twice, also feels right. Moving 90% of what is possible just ten times has no appeal either in task nor result. I don’t need bigger thighs or greater muscle definition in the legs; I want to be injury free and able to run for as many years as I am allowed. What I moved regularly on the leg press was twice their upper limit, which confused us all; I’ve described such an exercise (and use of that equipment) above. But these were not the people who most surprised us; it was all the other users. There was one guy, the definitive weed clearly in his first visits to the gym, who needed looking after and encouraging into some good habits, but the majority were there to pose. Or, worse, to answer their blasted phones. I’m sure Starbucks et al have made business decisions regarding their provision of wifi and the consequences in the way their customers use the facilities, but I did not (and do not) appreciate that users of the gym feel the same way, that they have in effect bought the use of a space where they can access their phone’s many facilities in relative peace. This experience is not repeated in the Beijing hotel gym, where a far greater percentage of fellow users have come to fulfil some predefined exercise targets. I may disagree with exactly what they’re doing but I applaud the premeditation. Indeed, we see a large fraction, maybe half, who know what they’re doing and attend with clear objectives in mind for the day, the week and longer term. Yes, there’s still a fraction who come to pose, but it is smaller. It probably helps (these are subjective measurements and we do affect the observations) that C runs the legs off any other user while she’s in there; I’m worse, because I’m clearly, noisily, in some discomfort zone. Even the pool users, visible from the treadmills, are rarely messing about. That might well be a feature of the hotel clientele, for, being expensive, there aren’t many kids around. Now there’s an issue that may prompt readers’ reaction: to what extent do you think kids should be encouraged to use weights at all? Is there an age (or stage) at which you change your mind? Do you distinguish between moving weight and aerobic trainers? We had some pretty solid ideas at Shiplake that supported our strategies and I am interested to canvass some opinions. Write, please. Pic at the top is from 2010, near HongKong. 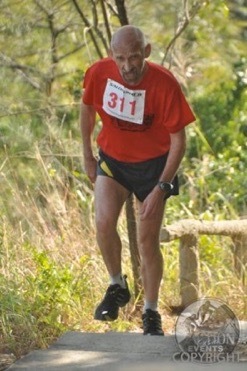 Official race picture, with less than a kilometre to go, at the top of a hill and with the old ticker in overdrive. Whole story in essay 66. 1 Oh, do keep up: her average to be 12kph and mine 14kph. Like it says. 2 Add 1% to any selected target; so if you enjoyed a 40minute 10km race at 35, it rises by 1% a year every year; 42:03 at 40, 46:26 at 45, 51:18 at 55, 56:40 at 65. I have disagreed with my own figures, though the peak I hit at 35 was consistent with these to 40. Changes in lifestyle after 40 made big enough changes to invalidate the observations. A good race for me at 35 was just under 37mins. I did a shade over 42 this year; that’s half a percent across 25 years, and the recent race did not feel representative of me racing as I have the last three years, though it might be representative of being in Beijing. Adding half a percent instead, the 40minute 10km race at 35, becomes 41:00 at 40, 42:03 at 45, 44:12 at 55, 46:27 at 65. The 1:30 half marathon drifts like this: 90 mins at 35; 94:24 at 45, 99:26 at 55, 104:61 at 65. My half-marathon PB at 55 makes a total nonsense of this, though, again suggesting that the decay is consistent only if all other factors stay constant, perhaps measuring the steady decay of that 35-year old lifestyle. See essay 263 for an up-dated explanation of this decay matter. 3 Calculation based something like this; at rest you breathe 20 times a minute, lightly—maybe a litre per breath. Under hard work, like a half of a soccer match, you might well be breathing per second and moving 4 litres, twelve times the previous volume. Allowing for variation, we (that class) thought the 12 times to be an upper limit; opinion said that the biggest variation would be among the relatively ‘fit’ people; their ‘at rest’ state would be lower in all respects and their ‘at play’ state would be higher than their ‘unfit’ colleagues. So the class said I was the one at risk more than them. By ‘fit’ we meant practised at exercise. 4 ton, tonne I don’t much care; the difference is a throw of the briefcase, 16kg above your head once. 2240lbs - 2204lbs = 36/2.2 kg = 16 kg all to 2 s.f. accuracy. At 65 rather than 35, moving 200 pounds rather than kilograms is about my limit, and 100 reps is certainly enough. 5 Ergonometer, measuring ergonomy. Ergometer, measuring work. Ergonomics; (i) making the box fit the man, not the man fit the box (ii) theories that make economics of consequence (iii) the measurement of consequences. Erg, from the Greek for work (Ergh, work? you must be kidding! I’m Greek, I don’t do work! ), a small unit of work predating SI units, 10⁷ ergs = 1 joule. Originally really ergonometer, read here for example. Disagreement even there; I remember it being properly called ergonometer and being shortened from sloppy usage. It may be a reversed error; if you force google to hunt for the longer word it does find many entries. I think that, since the correct Greek root is ergon, the longer word is the correct original and that it has been shortened by deciding that the machine was measuring ergs (units) of work, not the Greek version. I am dissatisfied with the dictionary entries I found; is that allowed?